Each summer, The First Church of Christ, Scientist opens its beloved fountain to the public. On hot summer days you're sure to find flocks of Bostonians cooling off at this famous landmark. After extensive renovations in 2005, the fountain is again open to children and groups for summer play. Fountain hours are every day from 9:00am -9:00pm, weather permitting. The 'child-safe' fountain design includes a cast-iron gate with 2-inch opening that allows 180 water jets to shoot directly out of the ground. There is even a new splash pool in the center of the fountain. 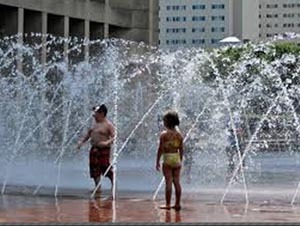 So now Bostonians young and old can look forward to an extra refreshing experience at the new fountain. Once the sun goes down, the streams of water become illuminated with light. This feature not only makes for a safer environment, but an aesthetically pleasing one too. The Mary Baker Eddy Library is located at 200 Massachusetts Avenue, between Huntington Avenue and Boylston Street. The reflecting pool is filled in April, and the fountain is generally on by May 1st. The fountain is usually off by November 1st. This fountain is both an important architectural landmark, as well as a great fountain to frolic in. At first I couldn't believe that such a significant fountain would actually be open for frolicking. It's like playing in the fountains at the Met --- until the police come. Yet when I contacted churchofchristscientist.org, I was able to confirm that the fountain was intended for waterplay among one of its uses. Thus it's officially both an architectural aesthetic element as well as a place to play in. In addition to confirming the permissibility of splashing around in the fountain, the Church also provided information as to the seasons that the facility is open: 'Usually the reflecting pool is filled in April, and the fountain is on by May 1st. The fountain is usually off by November 1st'. I was also impressed by the swiftness of their reply, which occurred the same day that I sent the question.